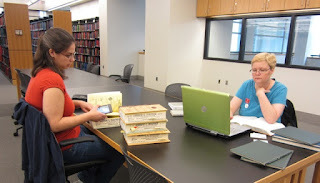 I had the most wonderful time this past weekend researching at the Allen County Public Library in Ft. Wayne, Indiana. Even though I didn’t break down any of my brick walls, I found some interesting things that I can’t wait to analyze further. What made it even better was the company there. 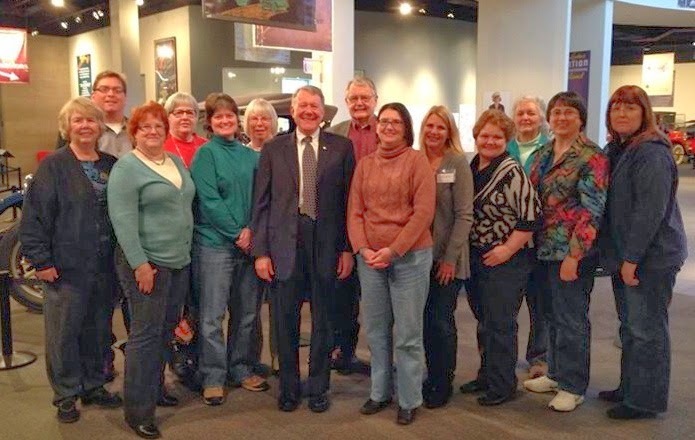 About twenty genealogy bloggers from the Midwest (and Canada) gathered for a weekend of research, camaraderie, and laughter. 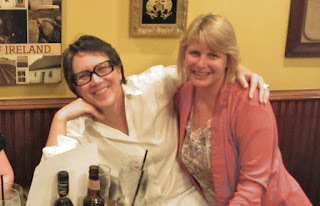 When Tina Lyons (Gen Wish List) and Terri O’Connell (Finding Our Ancestors) announced they were organizing a get-together for Midwestern genealogy bloggers, I jumped at the chance to attend. 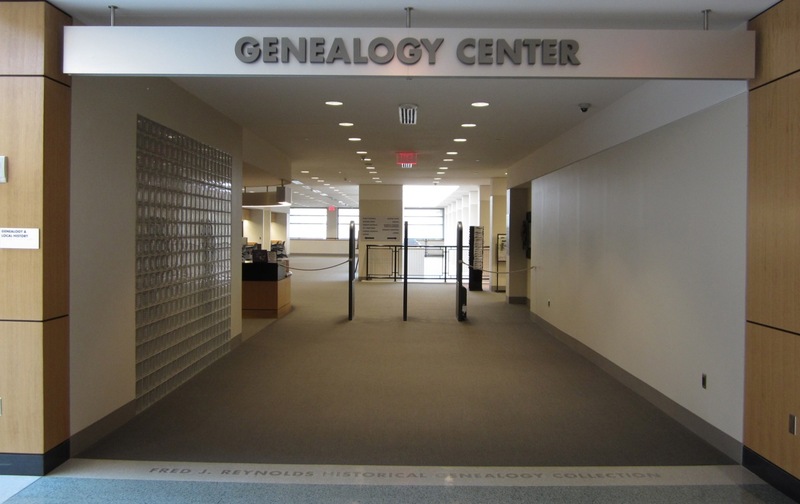 The Genealogy Center at ACPL is renown for its collection of U.S. and international resources. Since I’m starting to dip my toes into Irish research, I was particularly eager to take a look at those materials. 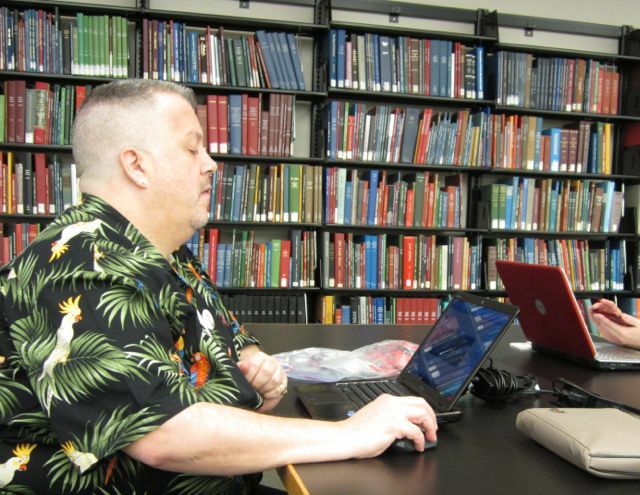 I watched the orientation video that that the library has online, and began making my research agenda. Family histories. State and county record abstracts and mug books. PERSI. 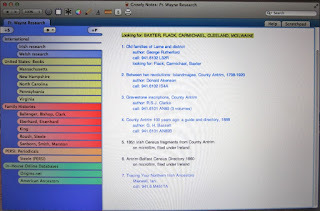 Irish cemetery transcriptions. Microfilm. 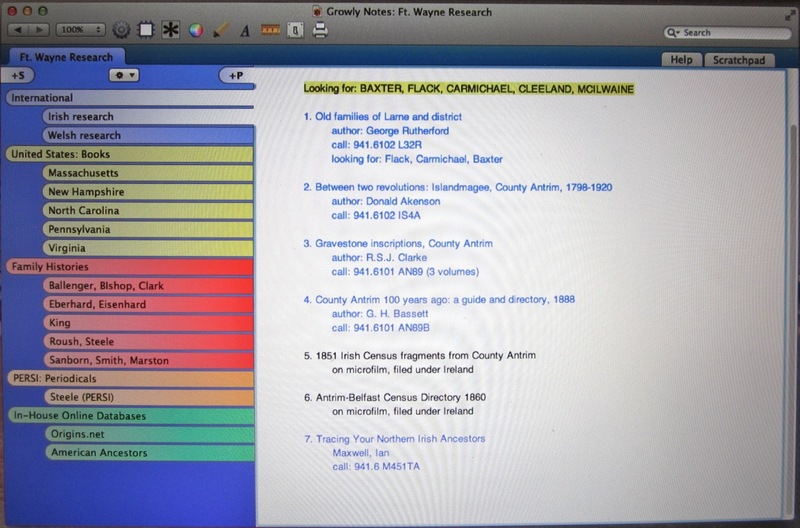 Online databases. Like a kid in a candy shop, my list grew and grew. Before I knew it, the weekend arrived. 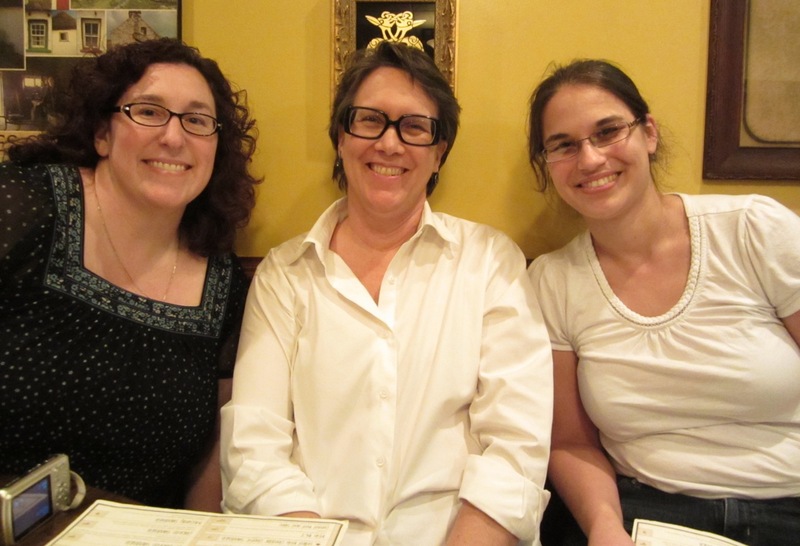 Stephanie Fishman (Corn and Cotton Genealogy), Jennifer Alford (Jen-Gen’s Family History), and I talked non-stop in the car the whole way to Ft. Wayne. I walked into the library with that sense of unbridled anticipation I always have for research trips. Anything is possible! The first person we saw was Tina. She showed us where Diana Ritchie (Random Relatives) and Laura Cosgrove Lorenzana (The Last Leaf on This Branch) were sitting and gave us an impromptu tour around. 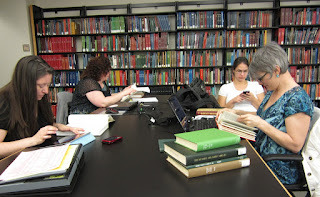 Studious little genealogists that we are, we grabbed some books and quickly got down to work. Then Thomas MacEntee (Geneabloggers, Destination: Austin Family) and Terri O’Connell walked in, soaked from the rain, and the party started. Susan Clark (Nolichucky Roots) joined us from the microfilm room, where she had been secretly hiding out getting things accomplished. 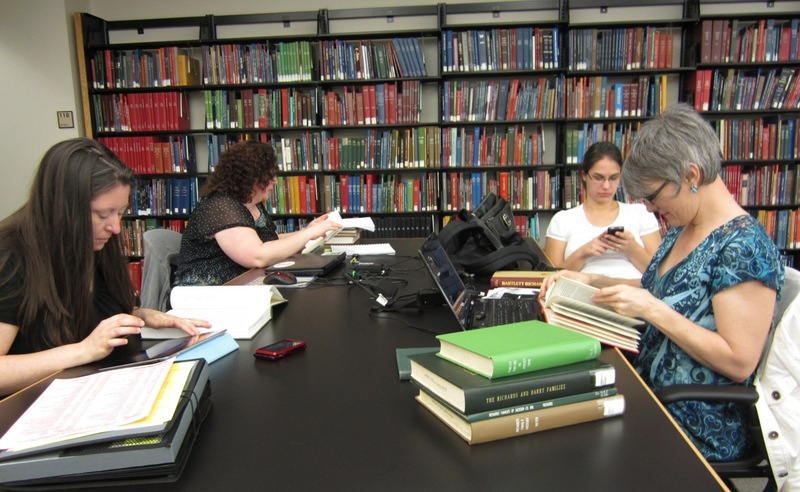 We crammed as much research in as we could until the closing announcement. We trekked to a nearby Irish pub for dinner and refreshments. I think that fit nicely with my Irish research goals, don't you? Jennifer Holik (Generations), Kathryn Lake Hogan (Looking4Ancestors), and a few others joined us there. The next day at the library our numbers increased. Margel Soderberg (2338 W. Washington Blvd. ), Brenda Leyndyke (Journey to the Past), Lisa VonLanken (The Shy Genealogist), Linda Swisher (Round Tuit Genealogy), Harold Henderson (Midwestern Microhistory), Lisa Ellam (The Faces of My Family), Patricia Biallas (Genea Journeys), and Diane Biddell (Adventures in Brown County History & Genealogy) were among those who joined us. 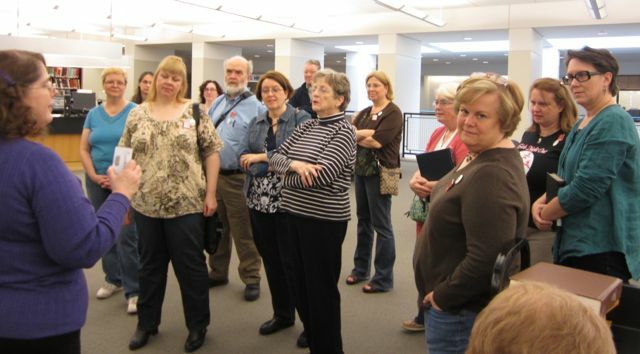 A librarian treated us to an official tour of the Genealogy Center. Back at the tables, it was so quiet you could hear the pages turning and the wheels in our heads spinning. I’ll share some of my discoveries once I’ve had a chance to analyze and process the information. Derek Davey (Genealogy—Northwest Ohio) stopped by to visit. 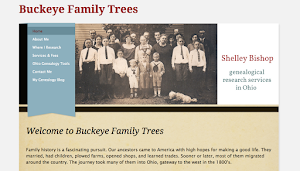 Jen Holik wowed us by showing us copies of Branching Out, her newly released genealogy books for kids. Her six workbooks—two each for grades 1-3, grades 4-8, and high school—look amazing. They’re sure to become a hit with teachers, scout groups, libraries, societies, homeschooling parents, and anyone who wants to help kids discover their family history. She's selling the books now on her website. After closing down the library that evening, we drove to Tina’s house. She had graciously invited us all over for a pizza party. 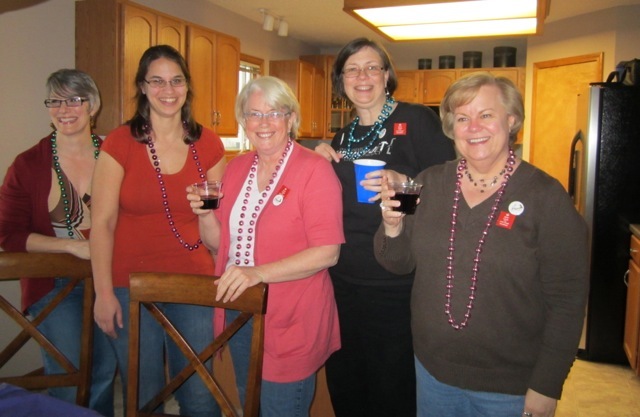 The beads, food, and conversation flowed into the night. Diana shared her father’s famous cookies. It’s hard to wear out a group of genealogists, but I admit to being one tired cookie myself as we drove back to the hotel. The next morning after breakfast we reluctantly said good-bye and headed back to the cities we had come from. I had such a good time. 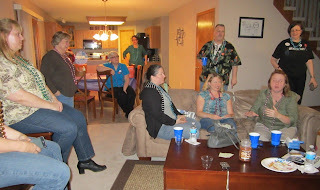 Thanks to Terri and Tina for organizing the get-together. It seems incredible to think I'd never met a single one of these people until the FGS Conference in Springfield last September, and many I just met for the first time this weekend. There’s already talk of doing another Midwest Geneabloggers event this fall, so if you weren’t able to come this time, keep a look out. I’ll share the news once a date is set, so you can join us. One thing’s for sure—Midwest Geneabloggers know how to have fun! It was such a great time. I glad that you could make it. 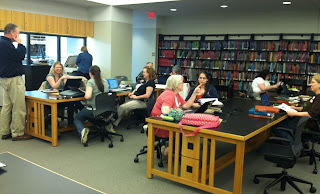 I'm still amazed at how quiet everyone was researching at the library on Saturday. Looking forward to the next meetup! 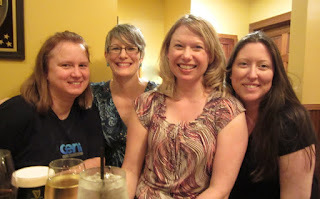 I enjoyed myself reading about your meetup! It appears to have been a resounding success. Thank you for sharing. It would have been even better if you could have joined us, Michelle! I so hope to have the chance to meet you one of these days. Wonderful, Shelley! I relived the weekend as I read this. So worth coming out of hiding. Hide no more, Susan. We all know now what a great sense of humor you have. And what you use chopsticks for. I'm so glad you came! Sounds like so much fun! Can't wait to get to Allen County myself..can people just pretend to be from the Midwest? Absolutely, Malissa! I can safely say we're an open and easy-going group. And the library was great. We'd love to have you at the next one! Thanks again for driving us out there Shelley! It was wonderful getting to spend so much time with genealogy buffs and have our hands on all those great resources. I look forward to hearing what you were able to find out about your family while there. I agree, Jennifer, both the facility and the company made it a special weekend. I seriously need to sit down and spend some time with the materials I collected. I was so busy looking through and copying things that I didn't stop to analyze anything while we were there. It was so great to meet you Shelley. I think most of us were re-energized by being with fellow genealogists, especially in the more relaxed atmosphere. I'm looking forward to hearing what everyone uncovers as they go through what they found, and to our next get together! Shelley, it sounded like a wonderful weekend--both productive and fun! Jealous! Hope it becomes a regular event!